The problem for today is how to drop the Town Creek span into Town Creek and find it and then retrieve it? First something about the bridge design. The Pearman is a cantilever bridge with a pair of cantilevers that support a central truss section. 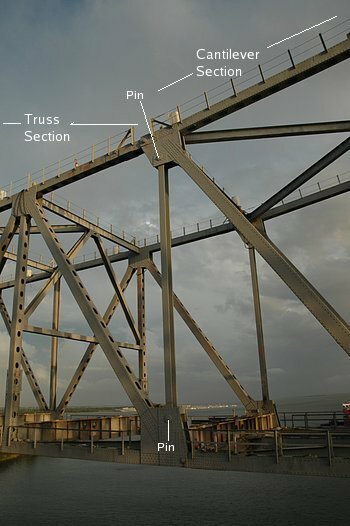 Here, the truss section is to the left of the pins while the cantilever section is to the right of the pins. 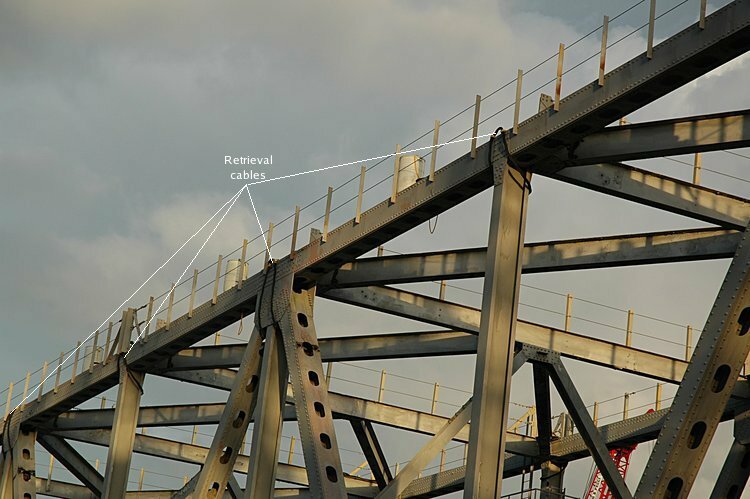 After the explosive charge separates the truss section from the cantilever section, the cantilever section will remain attached to it's supporting column - with the end just suspended (in this case) over the Port Authority area. 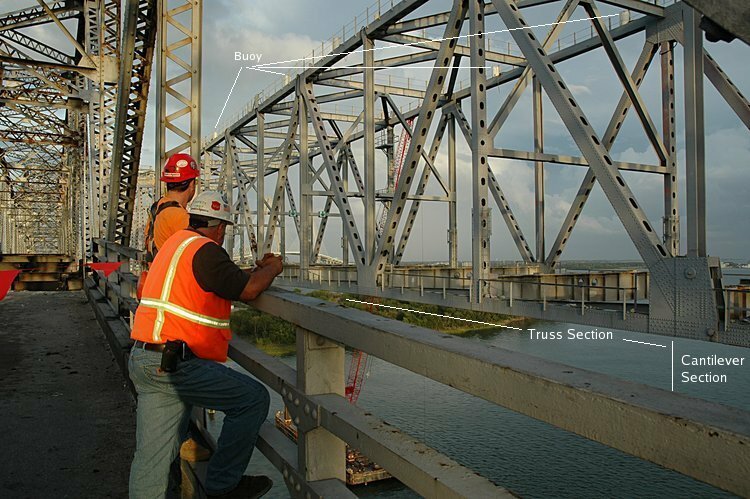 To remove the truss section, the connection to each cantilevered section will be compromised (by preliminary cuts and blasting). 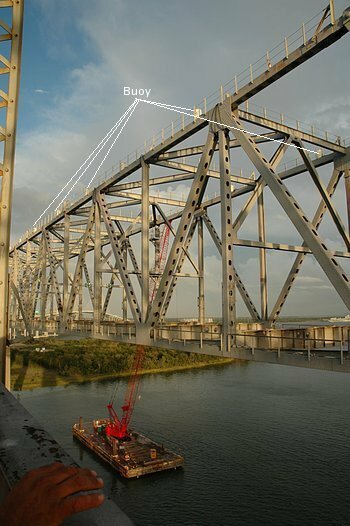 After the blast, the truss section (as 11 pieces) will drop into drum creek and be retrieved by a crane. To repaire for the removal of the truss section, you start by placing buoys over each section (the white barrels on the top girders) so that you can locate the sections after they are under water. Then you drop the truss section to the left of the pins (shown on the right - under the white barrel and there is another pin about 3 feet up from the bottom. A closer view of another V section. 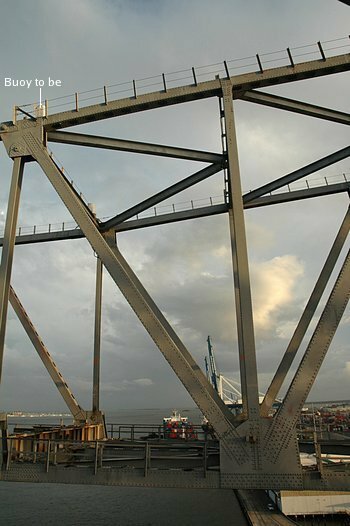 Note the to-be-buoy on the top left and the horizontal V girders joining the outside girders to the center of the vertical beam. 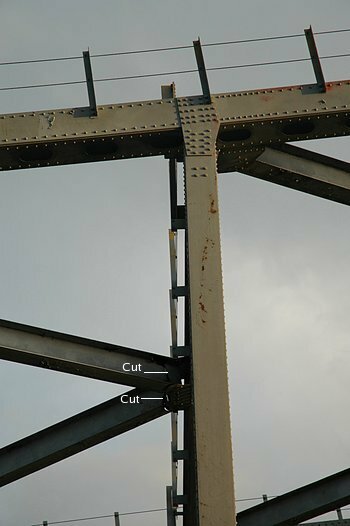 The horizontal V beams have been cut (you can see a bit of light at the bottom edge of the cut in the left image ) so that they will break away when the main span is dropped. The entire process is rather staggering - and here you can see a bit of the crane that is used to hoist workers to the top of the Pearman and for placing the buoys on the top. 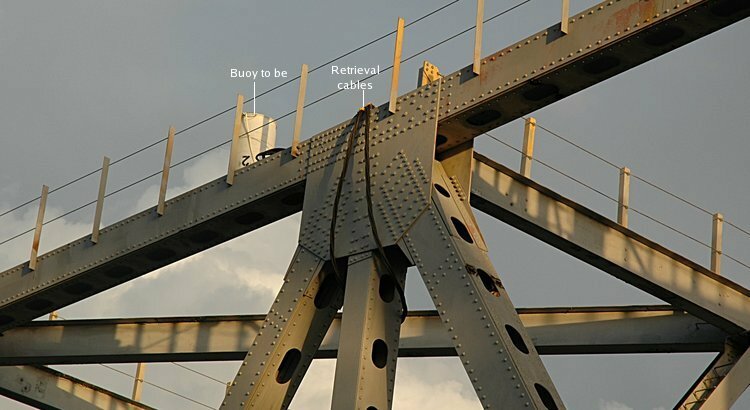 In addition, there are cables wrapped around many of the V joints and vertical joints. The cables and a buoy are better seen here. Why the cables and buoys? - when the section drops into Town Creek - the white barrels will float thereby marking the location of a cable. The crane will then raise a segment by coupling to the cables wrapped around the bridge segments.